Imagine an entire country, high. Holi, is a Hindu festival that marks the beginning of spring. Holi celebrates color, fertility, love and the power of good over evil. 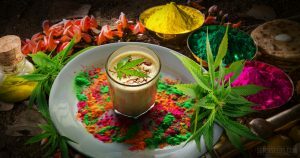 For one joyful day and night each year during Holi, a large population in India is entranced with cannabis, specifically bhang. Bhang (भांग) is the Hindi word for hemp or cannabis. It has become increasingly associated with a milky, spiced cannabis drink called bhang thandai. Think chai latte’s enhanced cousin. The Times of Indianewspaper points out that this communal cannabis consumption removes the constructs that usually dictate everyday life. Bhang opens the door for role fluidity between genders, ages and social classes. Bhang inspires minds and hearts to soar to greater heights where the mundane is, well, mundane. How is this possible in a country that technically outlawed cannabis in 1985? Bhang is historically made from stems and leaves obtained from male plants as well as female plants after pollination. While ganja is the product of the unpollinated female plants and contains a concentration of the psychoactive components of cannabis. Bhang starts as a green paste made by boiling cannabis leaves in water until they are like cooked spinach, then they are stone ground. Black pepper or onion seeds may be added. This mixture is then combined with thandai: milk, sugar, ground nuts, rose petals and various spices like cinnamon, ginger, cardamom and nutmeg. (see recipe below). The variations are infinite, some even include vodka. There are various other edible and drinkable bhang infusions including: yogurt lassis, dessert-like bhang goli balls, and deep fried vegetable pakoras. The milk fats, sugar and spices drive and sustain the cannabis high throughout the body. As researchers understand more and more about the entourage effect of terpenes and cannabinoids, bhang-based recipes will validate the age-old aphorism that food is medicine. Bhang has been part of the Ayurvedic medicine cabinet for millenia, probably thanks to Lord Shiva, the Hindu deity of creation and destruction. Shiva is attributed to bringing cannabis to the people of earth and is often depicted drinking or smoking cannabis in a clay chillum pipe. This is an accepted and revered aspect of spiritual life among sadhus (holy men), and certain Hindu sects, even outside of the Holi festival. The spiritual and medicinal uses of cannabis are well documented, even though western science is just catching on. If you want to experience Holi first hand, it is celebrated the night of the full moon in the Hindu month of Phalgun, which roughly corresponds with the month of March. There are regional differences. Most of the celebrations happen in central, eastern and northern India. 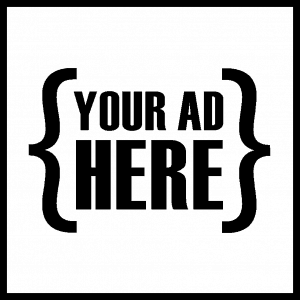 There are plethora of websites about the do’s and don’ts for Holi first timers. These tips include recommendations like: only buy bhang from governmentally issued sellers (not street vendors), apply copious amounts of coconut oil all over your body and hair for a protective film from the color powder, and stay in an open area, because the hallucinogenic effects may create feelings of claustrophobia. If being doused in colored powder and mud isn’t your cup of bhang, maybe the world’s largest competition is a good alternative. Imagine 46 lbs (21 Kg) of ground bhang churned with 40 gallons of milk and spices. Even though there are no winners, this annual competition in Raisalmer, a small township in Northeastern India, attracts over 2,000 bhang enthusiasts as part of the Ramdevra fair. For the recipe to serve 1,000 of your closest friends click here. Of course, you can buy bhang at select shops year round if your India trip does not coincide with this festival. 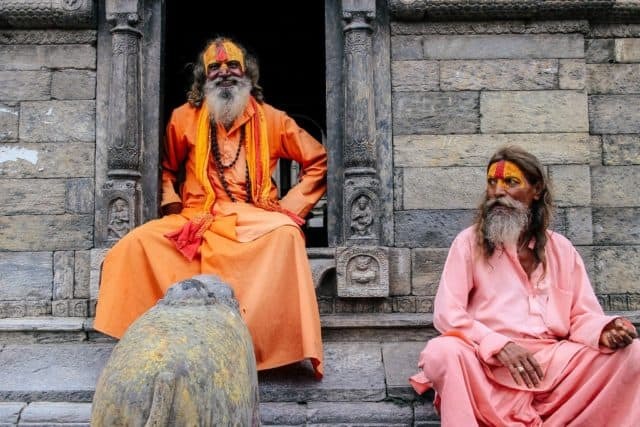 These shops include: the 10th generation bhang shop in front of Baba Mahakal Temple, located near Indore, a city smack dab in the heart of India. 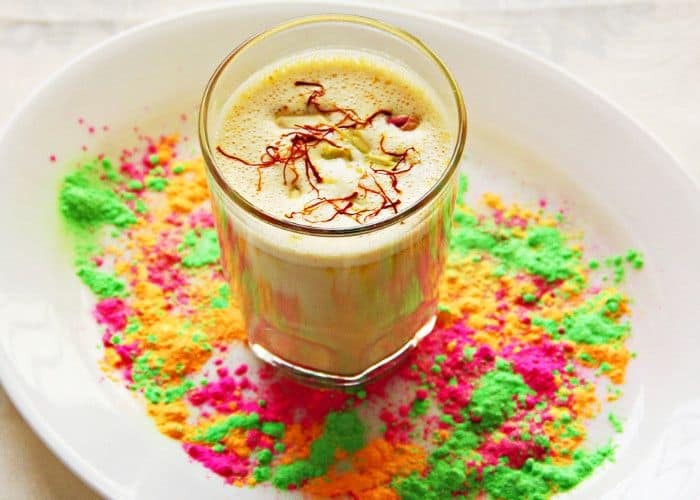 In lieu of planning a trip half way around the world, the spirit of Holi can be recreated on any stove top with the bhang recipes below. Always remember that edibles have a delayed onset, so don’t gulp down your concoction or dessert all in one go, unless you want to meet Lord Shiva in person. The most authentic and easy Indian edible ideas, can be found on the Whatshot.in website. The recipe below is a slightly edited version of their delicious Bhang Masala Chai. Once you adjust the active ingredient level to your personal preference, you may even consider replacing your morning cup of coffee with this creamy, relaxing drink. Many sadhus also ingest bhang to power up their meditation and to reach a very elevated state of spirituality. Even the Sufis use this as an aid to gain ecstasy! If using dried leaves place in blender to make a coarse powder. Combine the bhang powder (or bud/stem), water, milk, sugar, cinnamon, cloves, cardamom, black peppercorns, ginger and oil /butter in a pan and let it boil. Reduce the flame and let it simmer for around 20-30 minutes. Let it cool and strain the mixture with a cheese cloth or strainer. Place bhang masala concentrate in a jar and tighten the lid. P.S. The strained tea mixture, if refrigerated properly, stays fresh for a week.